Just a quick note to thanks you and the team for a stunning trip, the scenery, the roads, the bikes, were difficult to fault. 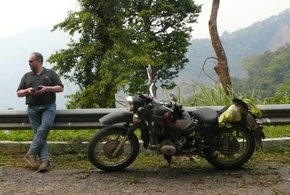 I will certainly try to organise a trip in 2011 for my 50th with a group of off roaders. Here is a link to the kind of side car trials I do back home. Look forward to seeing you again and selling a few places on your tours, and when you have some of the video you filmed on our trip, please send it on and I will put it on my face book.